After you have parsed and normalized the raw security telemetry events, the next step is to enrich the data elements of the normalized event. Enrichments add external data from data stores (such as HBase). Hortonworks Cybersecurity Platform (HCP) uses a combination of HBase, Storm, and the telemetry messages in json format to enrich the data in real time to make it relevant and consumable. For example, the GEO enrichment provides latitude and longitude coordinates plus the city, state, and country for an external IP address. You can use this enriched information immediately rather than needing to hunt in different silos for the relevant information. Extracts data from existing fields. Brings in profile or machine learning results. Adds information about city, country, postal code, latitude, and longitude for IP addresses. Provides information about host, user, and any other assets derived from organizational data sources such as CMDB or employee databases. Provides ownership information of the web domain. One of the advantages of the enrichment topology is that it groups messages by HBase key. Whenever you execute a Stellar function, you can add a caching layer, thus decreasing the need to call HBase for every event. Prior to enabling an enrichment capability within HCP, the enrichment store (which for HCP is primarily HBase) must be loaded with enrichment data. The dataload utilities convert raw data sources to a primitive key (type, indicator) and value and place it in HBase. You can load enrichment data from the local file system or HDFS, or you can use the parser framework to stream data into the enrichment store. The enrichment loader transforms the enrichment into a JSON format that HCP can use. Additionally, the loading framework can detect and remove old data from the enrichment store automatically. After you load the stores, you can incorporate into the enrichment topology an enrichment bolt to a specific field or tag within a Metron message. The bolt can detect when it can enrich a field and then take an enrichment from the enrichment store and tag the message with it. The enrichment is then stored within the bolt's in-memory cache. HCP uses the underlying Storm routing capabilities to ensure that similar enrichment values are sent to the appropriate bolts that already have these values cached in-memory. HCP supports two types of configurations: global and sensor specific. The sensor specific configuration configures the individual enrichments and threat intelligence enrichments for a given sensor type (for example, squid). This section describes sensor specific configurations. Batch loading is used to load information that does not change frequently. For example, batch loading is ideal for loading from an asset database on a daily or even weekly basis because you don't typically change the number of assets on a network very often. 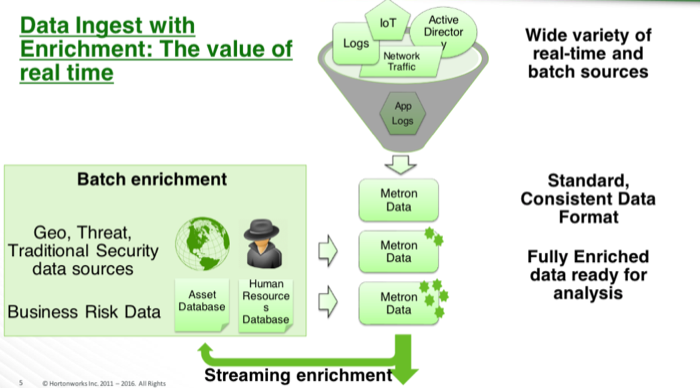 Streaming enrichment information is useful when you need enrichment information in real time. This type of information is most useful in real time as opposed to waiting for a bulk load of the enrichment information. You incorporate streaming intelligence feeds slightly differently than when you use bulk loading. The enrichment information resides in its own parser topology instead of in an extraction configuration file. The parser file defines the input structure and how that data is used in enrichment. Streaming information goes to Apache HBase rather than to Apache Kafka, so you must configure the writer by using both the writerClassName and simple HBase enrichment writer (shew) parameters.